^ Crane, P.R. (1988). "The phylogenetic position and fossil history of the Magnoliaceae". In Hunt, David R. (ed.). 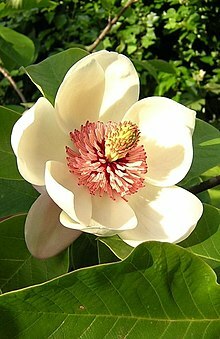 Magnolias and their allies: Proceedings of an International Symposium, Royal Holloway, University of London, Egham, Surrey, U.K., 12-13 April 1996. Milbourne Port. p. 21. ISBN 9780951723487. OCLC 40781614.